I'll be getting some new sentiments soon, I promise! I just love the look of the Flower Soft and decided to take my card to the next level by adding a little more dimension with my Flower Soft. It's pretty easy to do, and all you need is your PVA Glue, Flower Soft and some wire. Luckily for me, I never got rid of my retired Wire Works! To start, I cut my wire about 5 inches long (you can trim it later), placed a line of PVA Glue on my wire, then started to add my Flower Soft. You'll want to continue to add, and gently push the Flower Soft onto your wire, when done place in a piece of Styrofoam until the glue sets - about 15-20 minutes depending on how much glue you actually used. My vase was stamped on my Labels II Nestabilities, then stamped again on my Candy Lane DSP and cut out. I adhered the pattern piece to my stamped image by placing a few dimensionals on the edge. Keep the center open so you can place your flowers in your vase. To adhere your flowers inside your vase, cut to size, then place a small amount of PVA glue on the end and slip into place. The green curly accent piece you see is simply a sliver of Celery card stock that I twisted and added for dimension. I placed my focal image onto my Riding Hood Red Labels II piece with dimensionals then onto my Candy Lane DSP panel also with dimensionals. Fro some added dimension, I pierced around the Nestabilities. 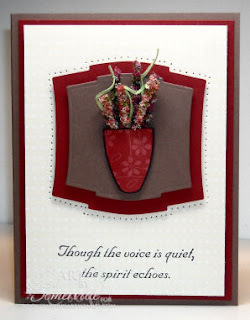 The sentiment I used from Starving Artistamps can be seen here. Don't forget when shopping at Starving Artistamps you can save 10% on the Doodle Factory and Starving Artistamps line of stamps by using discount code savetenls. Be sure to check back tomorrow - as I have a few other things to share and some blog candy! Sooooo beautiful. I am so thankful that you added instructions plus the close up picture. Very easy to follow. And the reminder about the code. Nice to know. Gorgeous Lisa. I really need to pull my flower soft out. I'm afeard. 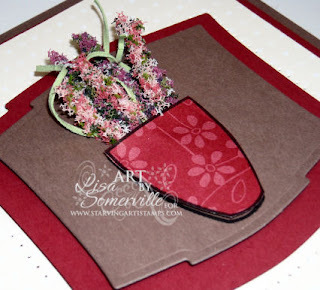 Love this card Lisa and I will have to check out the flower soft you have been doing some gorgeous art work with it. Wonderful idea! Love the 3-D! Extremely pretty card. Jeesh, Lisa....your card is beautiful...but it's getting kind of gloomy around here!! LOL! I've been wanting to try this with my flower soft...but it seems like it might be messy and I hate having gluey fingers! LOL!